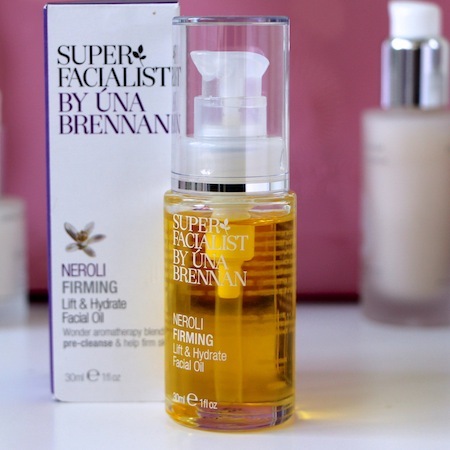 Depending on your budget this oil Super Facialist Neroli Oil could either be a luxurious addition to your bathtime cleansing ritual or a “reserve” product for when you need extra makeup-removing power but don’t want to use up your very expensive balms. For those who would usually spend around five or ten pounds on a cleanser, a pre-cleanse oil costing nearly fifteen may seem like an indulgence, but I have to say that it’s a pretty nice indulgence. The oil is fragrant and rich and you can really massage it into the skin to dissolve makeup, turning a quick cleansing session into something more pampering. For those who might spend twenty or thirty pounds on a high-end cleanser, a pre-cleanse oil coming in at this kind of price could be something of a Godsend – it does the dirty work, so to speak, and allows you to use far less of the more expensive cleanser. Whichever way it fits into your own routine and budget, it’s a handy addition. I was never really sold on the idea of a “pre-cleanse” until I realised that it was, in fact, just an extra bit of cleansing to make sure that all of your makeup was off. Which makes sense. If you use a white flannel (facecloth) the next time you cleanse and turn it over to the clean side after you’ve finished, do a little bit of a cleanse again and see if anything else comes off. You can almost guarantee that there’ll still be a bit of makeup that creeps its way onto the flannel – if you’ve a face full of heavy foundation then it’s unlikely that you’ll get it all off in one hit. I always do a little check to make sure – I don’t want to sit there washing my face for hours unnecessarily but…if you’re going to do a job do it properly, blah blah blah. It’s not at all necessary to have two cleansing products if you’re going to cleanse twice but it can make bathroom life more interesting and a little more decadent. And I do like these pre-cleanse oils from Una Brennan Super Facialist – I reviewed the rose one quite a while ago, which is aimed at slightly drier skin, I think. Though you’re taking them off (and they do rinse off completely clean when you use a washcloth, take note anxious oily-skins!) and so I’d say to go with the one that will give you most joy. I find it hard to choose between rose things and neroli things and so I won’t take sides – they both perform equally well. You can use a few drops as a face treatment, too, making these properly multi-purpose. (You could do the same with most face oils, but at luxury prices you wouldn’t want to be pouring them down the drain.) Whichever way you use it, take the time to massage it in and have a few moments to yourself – I’ve started to realise the stress-relieving benefits of some of these slower beauty rituals. You can find the SupercaliFacialisticexpialidocious Oils at Boots.com here – they cost £14.99 each. For cleanser reviews, please click here.